Beautifully engraved check from the County Treasurer of New York - National Broadway Bank issued in no later than 1870. This historic document has an ornate border around it with a vignette of an old sailor, an indian, a ship and an eagle. The check is signed by the New York City Mayor A. Oakey Hall, City Comptroller Richard B. Connolly, and the Clerk J.P. Touny. 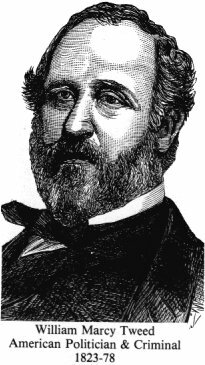 After the Civil War, the warring factions of the local Democratic Party became united behind the leadership of a pro-union Tammany Hall leader named William M. ("Boss") Tweed. Boss Tweed had the legislature authorize a City charter which gave the City government more autonomy and home rule. Understanding the value of public works, he actively sought rapid expansion of the City's physical infrastructure, extending streets and sewers to most of Manhattan on the East and West sides of Central Park and the sleepy, farming village of Harlem to the North. This combination of events led to the Tweed Ring. The ring consisted of Tweed and his henchmen�Peter Sweeny, City Chamberlain; Richard B. Connolly, City Comptroller; and A. Oakey Hall, the Mayor who controlled the city without interference. They defrauded the city and openly bought votes, encouraged judicial corruption, and controlled New York City politics; estimates of the amount of money the city lost to the ring range from $30 million to $200 million. City judges became notoriously corrupt. Attempts within Tammany to oust the Tweed Ring failed, and in 1870 Tweed forced through the state legislature a charter that greatly increased the powers of the ring. Tweed maintained personal popularity because of his openhandedness and charity to the poor. The immediate cause of Tweed's downfall was the publication in the New York Times of evidence of wholesale graft revealed by M. J. O'Rourke, a new county bookkeeper and the effective cartoons of Thomas Nast that aroused public indignation. A committee of 70, organized to fight Tammany, elected most of its candidates in 1871, although Tweed himself was returned to the state senate. Largely through the efforts of Samuel J. Tilden, Tweed was tried for felony, but the jury could not reach a verdict. In a second trial he was convicted and given a 12-year prison sentence; this, however, was reduced by a higher court, and he served one year. Arrested once more on other charges, he escaped and went to Cuba and then to Spain, but was extradited (1876) to the United States. He died in prison two years later.